In just a few days it will be 2017. I’m just gonna sit here and wait till that sinks in. According to Back to the Future, we should all be driving flying cars and cruising on hover boards by now. 2016 may not have brought us the self lacing shoes or Jaws 10 in 5D but doesn’t mean it wasn’t an interesting year. Before I started writing this post I went back to the resolutions, or rather promises I made to myself at the end of 2015. Even though we all forget about these resolutions by mid January, I am proud to say that I did accomplish most of the promises I made to myself. Perhaps not exactly as planned but I did travel solo, I did travel more, I was more me than ever, I definitely did more exploring, more blogging and spent more time with my husband. Yoga is the only one I did not get to do this year but who knows, perhaps 2017 will become my yoga year. 2016 has been a year of greats. Great achievements. Great losses. Great lessons learned. 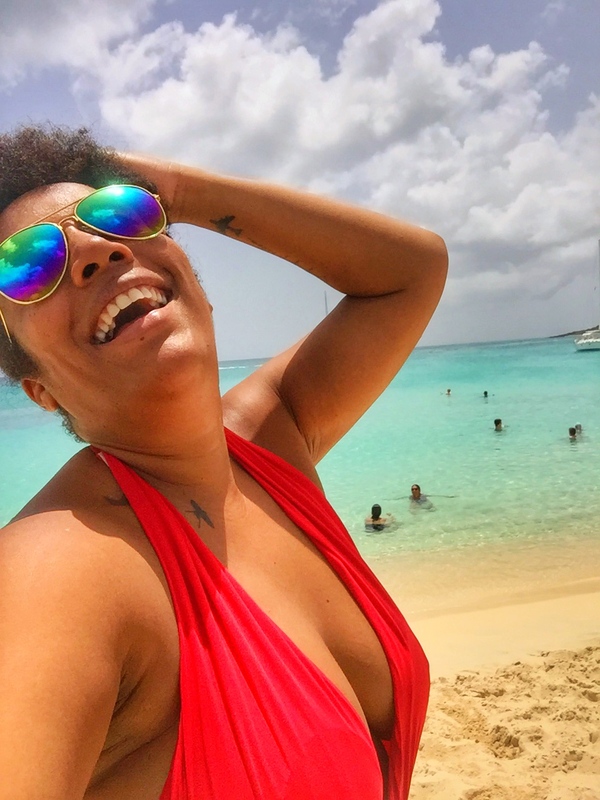 I got to see two new Caribbean islands this year and I learned to always keep my GoPro charged and my selfie stick handy. I’ve been blessed to have traveled to a few exciting destinations this year, even though it was a financially devastating year. Washington DC, the Dominican Republic, Anguilla, St. Barth, Guadeloupe and Curaçao were all stamped in my passport in 2016. Guadeloupe definitely gets the “Excellence” award, while Anguilla gets the (surprise, surprise) “Best Beaches” award. I must give St. Barth the “What a nice Surprise” award. I have been to this little French isle many times before but this was the first time I stayed over. The people were super pleasant and there was more to it than just Nikki Beach and celebrity gawking. I got my first gig as a travel blogger this year when I was hired to review the Fountain Resort in Anguilla and after that Villa Blue Rock and Welcome Car Rental in St. Barth. I got to finally swim in a river for the first time and I liked it! I also traveled with my mom for the first time as an adult this year . It took a little getting used to at first but it is an experience I will definitely want to repeat. Just to see her face light up whenever she sees something new is worth all the extra arrangements. And who can forget the first time I got to ride horseback on the gorgeous Maunday Bay in Anguilla? Definitely on the top of this list is swimming by the Cascade aux Ecrevisses in Guadeloupe and getting my husband to join. What a great moment. Driving through the Parc National was another Guadeloupe highlight we quite enjoyed. Then there was hiking the dunes of Baní in the Dominican Republic. Who can forget the great shoe fiasco there? Also in the DR, getting to see my first waterfall up close, when I finally reached el Salto de Jima after quite a hike. Drinking wine on the sofa with my long lost friend Lela and seeing my Dutch friend Ilona again after so many years. I saw flamingos at sunset in Curaçao, I snorkeled in a cave in Anguilla and I spent my birthday exploring the wonders of Washington DC all by myself and found that I enjoyed the solitude. But of all my experiences none was more memorable then the people I got to meet this year. Social Media is not called that for nothing and especially Instagram introduced me to quite some characters that I was lucky enough to shake hands with in person. Two of Anguilla’s beauties Bikini Sunset and The Only Vanessa, funny Jen from Drinking the whole Bottle, the amazing Sarah from JetsetSarah, the inspiring Elton St. Jago from EltTravel, daredevils Will and George from the Golden Arc Expedition and just this month Caribbean travelers Naya Blue and Mango Eddie from Caribbean Soul Trekkers. I’m not as adventurous as I thought I was. Hiking a flat trail to a natural pool or jumping into a cold river by a waterfall does not exactly make you an adventure traveler. I am a 40-something year old traveler that likes her comfort and sometimes luxuries. I have also learned that although I love exploring new and old destinations there are a few things I would never be able to turn a blind eye to or become immune to: animal abuse and neglect and littering. I had to learn this the hard way when I was confronted with piles of garbage alongside the roads in the Dominican Republic, the blatant littering by the locals and the cries of hungry kittens in the middle of the Zona Colonial is something I cannot un-hear. Neither will I ever be able to forget the sight of dog carcasses lying on the side of roads there. I have learned that Blog Posts with headlines like “I quit my job to travel the world” does not mean that you too can just up and leave. Becoming a travel blogger was one of the best things I have ever done but I will not lose myself in the delusion that it will ever make me rich or even financially stable. It is something I enjoy immensely and hope to continue doing for years to come. Well, I have decided to let the chips fall where they may and just wing it. Let 2017 surprise me. I do hope to travel to at least one place I have never been to before and hope to see more Caribbean islands. I hope to continue to grow as a travel blogger and look forward to receiving more gigs. But above all else I just hope I continue to be blessed with those I hold dear in my life and hope to adopt one or two more paw babies. What are your hopes and wishes for 2017? Don’t be shy and don’t hold back. Much love to you all and a happy New Year. May 2017 bring you travels, new friends and exciting adventures. Great post, Riselle! Have a wonderful 2017 filled with new adventures! Thank you, guys. Same to you. Great read! We are looking forward to you trekking to an island with us in 2017! I thoroughly enjoyed reading your entry and it’s an honour to have been part of your year 😀 . All the best for 2017 full of travels and adventures! Danki Elton. Let’s go on another Curaçao adventure together on 2017. I loved the piece, as usual and it confirmed that my decision long ago to let every year surprise me was a good one, no resolutions, no promises. I guess Wisdom comes with age. I wish for you in 2017 more travel, more blogging and girl try flying by the seat of your pants! Trust me it’s exciting. Bon Aña xoxo. Thanks Cassie. You’re the best. I absolutely loved reading this post Riselle! It’s so nice hearing about all of your travels this year and the amazing experiences you were lucky enough to have. I can’t believe 2017 is just days away and it’s time I started thinking about the things I learnt in 2016! Thank you, Viola. Wishing you many travels and happy blogging in 2017.